One of the most common questions we receive in our fly shop is "where do you fly fish in Indiana?". Our standard answer is "anywhere" and that is because we know fly fishing is more than just fishing for trout. Good thing because Indiana is not know for it's trout waters. In fact, if have been looking for some trout waters in central Indiana about the only waters you will find is the tailwaters of the Brookville Reservoir. There are other locations within the state of Indiana. 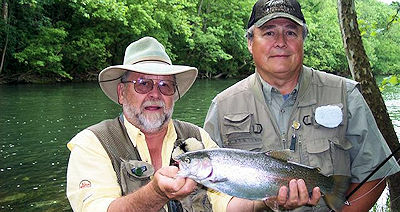 There are also a few places closer to Indianapolis that have trout, both public and private. However, The Brookville Tailwaters have a good population of Brown and Rainbow trout and each year they have a significant number of fish that hold over. Many of the other locations around central Indiana are more "put & take" in that the fish die out during the warm summers or are generally all harvested. The tailwaters are a two and a half mile section of the outflow of the Brookville Reservoir that flows into the Whitewater River. Fortunately, the water is released from deep within the reservoir so it remains cold throughout the summer and the trout can survive. The conditions of the outflow and the stream itself allow for a large population of sowbug, scuds and planaria worms to grow and help sustain the fish. The tailwaters are located just ninety miles South East of Indianapolis. They are easy to get to if you just follow Brookville Road (State road 52) all the way into the town of Brookville. Before you go, make certain to check the flow rates of the tailwater as this may determine whether you should make the trip or not. There is no schedule as to when the dam is opened to release water. So be prepared to get out of the water if you notice it rising. Below are a list of useful links that can help you plan your trip to Brookville. You can also call us at the shop for any advice, recommendations and the latest report on the conditions. We stock lots of productive flies, leaders, tippet, fly lines, rods and reels that are perfect for the Brookville Tailwater. FlyMasters also provides guided trips to the Brookville Tailwaters. If you do not know how to fish a tailwater for trout or would simply like to learn the waters more quickly then book a trip with FlyMasters and we will guide you to the right spots. The Brookville Tailwaters are a very nice little trout fishery in the middle of warmwater country. FlyMasters can help you take advantage of this little gem and get the most enjoyment from you time on the water.